(DailyStar)BEIRUT: Around 400 people marched from Dora, Greater Beirut, to the Electricite Du Liban building in Mar Mikhail Sunday calling for social justice and with the hope of relaunching the anti-sectarian movement that rose to prominence last year. Protesters chanted anti-sectarian slogans as they marched through residential areas with the hope of generating interest from passersby. Anti-sectarian movements are a small but long-standing feature of the Lebanese political scene but became particularly prominent in the early half of last year, with activists holding weekly protests, at one point attracting 20,000 people in a march from Beirut’s Ashrafieh district to the Interior Ministry in Sanayeh, before the movement appeared to lose momentum. Among the demands of the protesters are better transportation, education, rent control, wages and women’s rights, with Sunday’s protest focused particularly on the country’s crippled electricity sector. “We’re bringing all the campaigns together,” Moawad explained. “Sectarianism is responsible for everything. 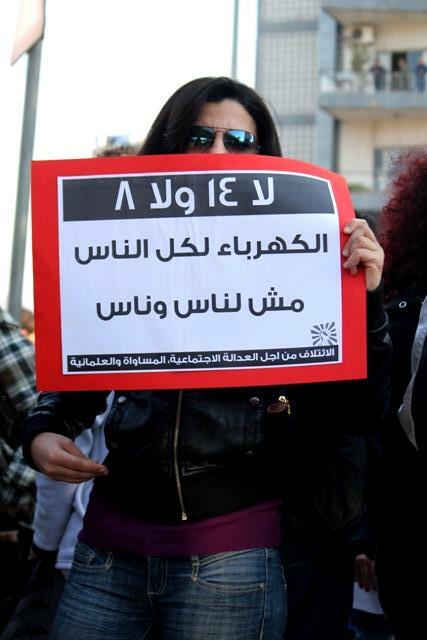 There’s nothing right in this country, no work, no benzene [fuel], nothing,” said 19-year-old chemistry student Carina Ayoubia during Sunday’s protest. The protest was advertised in the prior days as a funeral for EDL, the state electricity company which provides just 21 hours of electricity a day in Beirut, and fewer outside, and at the end of the march organizers hung a funeral wreath on the gates of the building. However she also added that, “the main problem is the electricity,” and not sectarianism. 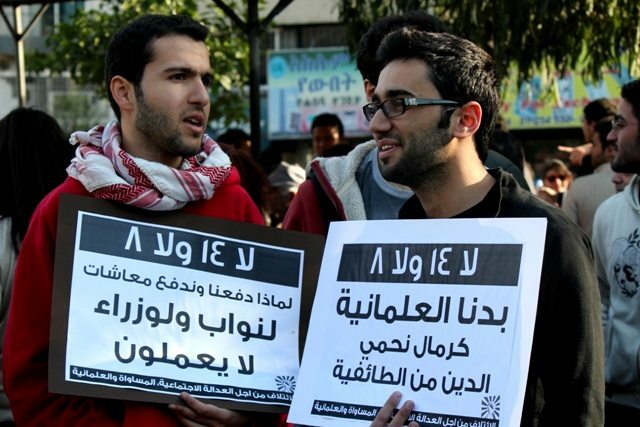 Civil society demonstrations have been on the rise over the past number of years in Beirut, with the first recent milestone in April 2010 when 5,000 people marched from Ain al-Mreisseh to Parliament to demand an end to the sectarian system. Some activists cited the Arab Spring as inspiration for last year’s protests, following the toppling of leaders in Tunisia and Egypt in the early months of the year. But last spring’s slogan, echoing the Arab uprisings, “the people want the end of the [sectarian] regime,” was only briefly heard at Sunday’s protest, before being drowned out by other chants. Speaking to The Daily Star at the protest, 29-year-old engineer Mohammad said the anti-sectarian movement had important differences to the uprisings in the rest of the region. Active in last year’s anti-sectarian movement, he said the time was ripe for a rebirth.